Mr. 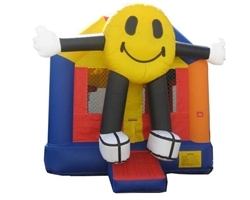 Happy Face welcomes you inside this bounce house! Tickle his feet as you enter into the large and bright inflatable. The Happy Face bounce house is a popular rental for kids and adults alike. You can’t help smile when you see it!